Clare Wilson is starting over. She's had it with her marriage to a charming serial cheater. Even her own son thinks she's given his father too many chances. With the support of her sisters, Maggie and Sarah, she's ready to move on. Facing her 40th birthday, Clare is finally feeling the rush of unadulterated freedom. Love this author and narrator. 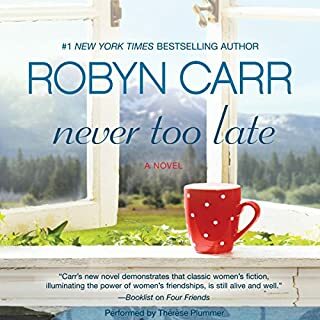 I've listened to several of Robyn Carr's books and they are always enjoyable. This best part of her books are the way Therese Plummer brings all the characters to life. In this book there are three adult sisters, four adult men, a teenage boy and two teen girls. Ms Plummer is able to give them all believable and distinct voices. At no time, as a listener, was I ever taken out of the story trying to figure out who was speaking. Ms Plummer is a very talented voice actor and I always enjoy her performances. The combination of Ms Carr and Ms Plummer is always a fun read. After losing her sister in a devastating car accident, chef Quinn Weller is finally getting her life back on track. She appears to have it all: a loving family, a dream job in one of LA's hottest eateries, and a gorgeous boyfriend dying to slip an engagement ring on her finger. So why does she feel so empty, like she's looking for a missing piece she can't find? This is the first book I've listen to by this author, also this reader. The story was good although a bit simplistic. Unfortunately the reader was distractingly bad. She has a halting style of reading the story that is hard to listen to. At times she didn't keep the voices of the two main character distinct so it was hard to figure out who was speaking. Her voice for a teenage boy, who was supposed to be a bit of a hero in the story, sounded like Beavis and Butthead. I would consider reading another title by this author but I will never buy another title with this reader. 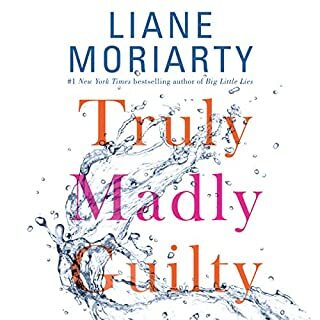 Where does Truly Madly Guilty rank among all the audiobooks you’ve listened to so far? Definitely near the top. I love Liane Moriarity and have read or listened to all her books. What other book might you compare Truly Madly Guilty to and why? Hard to say. Ms Moriarity's work is unique. Clementine or Vid. Clementine because she so clearly struggles with many things that women who are mothers and have their own passions outside of motherhood may have a hard time with. Vid because he is so at peace with his life yet very aware of goings on the other think they may be keeping from him. I think his family underestimate him but he adores them regardless. I wish! 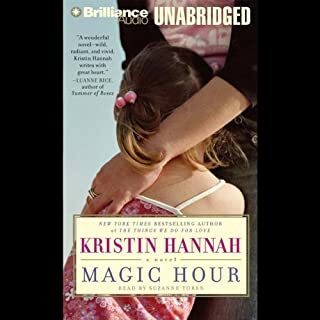 It's on the long end of audiobooks but I was still sad when it ended. The interview with the author by the narrator at the end was wonderful! As a young girl in Miller's Valley, an ordinary farming town that may be facing its final days, Mimi is observing adults, selling corn, growing up and changing, and watching the world around her change, too. As the years go by, the unthinkable starts to seem inevitable. Anna Quindlen's novel takes us through the changing eras of Mimi and her family, as secrets are revealed, and the heartbreaks of growing up and falling in love with the wrong man are overcome. Would you listen to Miller's Valley again? Why? 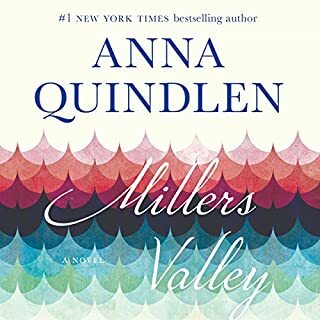 Yes, as always, Anna Quindlen crafts a beautifully written story with fully developed characters. The narrator, Ms Pressley does a great job as well. What was one of the most memorable moments of Miller's Valley? I can't say without giving away a key part of the story and why the main character makes certain choices. Have you listened to any of Brittany Pressley’s other performances before? How does this one compare? I've never been disappointed in anything written by Anna Quindlen. Twenty years ago, six Penn students shared a house, naively certain that their friendships would endure - until the death of their ringleader and dear friend Bea splintered the group for good. Now, mostly estranged from one another, the remaining five reluctantly gather at that same house on the eve of what would have been Bea's fortieth birthday. No, I would not. The story idea is great and it is technically well written however the characters are for the most part very unlikable. Because the idea of the story was interesting I listened all the way through. Unfortunately, one of only two remotely likable characters dies in the first couple of chapters. The other is a secondary character who is not really instrumental to the story. The five main characters are kind of awful people and the author does nothing to let us see that they may not really be that self serving underneath. Yes, they are "damaged" and that is explained. Nearly every book has those types of characters but they are usually able to make these characters people that you care about. Not the case with these characters. 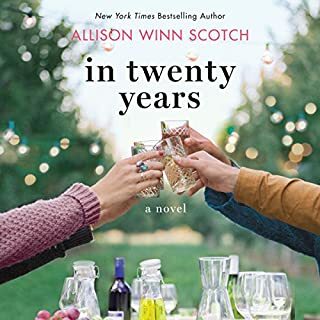 If you’ve listened to books by Allison Winn Scotch before, how does this one compare? Have you listened to any of Julia Whelan’s other performances before? How does this one compare? Ms Whelan is the reason I selected this book. She is an excellent performer and I have enjoyed her other audio books very much. Could you see In Twenty Years being made into a movie or a TV series? Who should the stars be? It has been two years since the death of Merritt Heyward's husband, Cal, when she receives unexpected news - Cal's family home in Beaufort, South Carolina, bequeathed by Cal's reclusive grandmother, now belongs to Merritt. 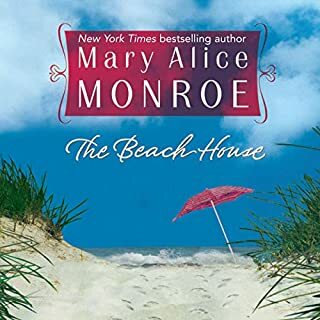 Charting the course of an uncertain life - and feeling guilt from her husband's tragic death - Merritt travels from her home in Maine to Beaufort, where the secrets of Cal's unspoken-of past reside among the pluff mud and jasmine of the ancestral Heyward home on the Bluff. 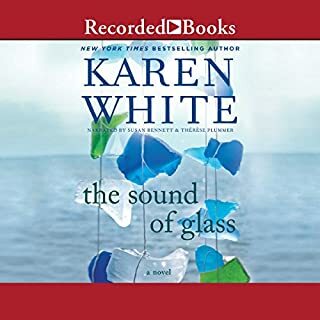 This is the first book I've read by Karen White and I'm excited to see that she has many more books for me to explore. This story has twists and turns to keep the reader interested. The character are fleshed out well and very believable. The performers did a wonderful job. I listened to other books narrated by Terese Plummer and she never disappoints. Caretta Rutledge thought she’d left her Southern roots and troubled family far behind. 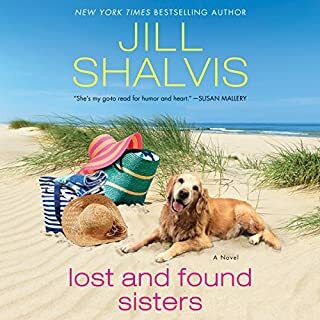 But an unusual request from her mother – coming just as her own life is spinning out of control – has Cara heading back to the scenic Lowcountry of her childhood summers. Before long, the rhythms of the island open her heart in wonderful ways as she repairs the family beach house, becomes a bona fide “turtle lady” and renews old acquaintances long thought lost. The story is good, interesting. Unfortunately the recording quality is very poor. You can hear every breath the narrator takes, hear her licking her lips and swallowing. I think I even heard a hiccup or some other bodily squeak. I don't blame the narrator, also the author. Obviously, every reader breathes, etc but you don't hear it in most narration. The production quality diminished the overall experience which takes away from a good story. Illustrator Lucy Brighton loves her work. Her animal characters Izzy, Bizzy, and Lizzy have their own comic strip, card line, and children’s cartoon, and their popularity has given Lucy financial stability and freedom. Yet none of that quite erases the lingering ache of a cold, lonely childhood. Then Lucy receives a call to say that her mother and father have been killed in a car crash. While settling their affairs in Florida, Lucy begins to realize how little she really knew about their lives. Someone who likes trite dialogue and whiney poorly accented narration. 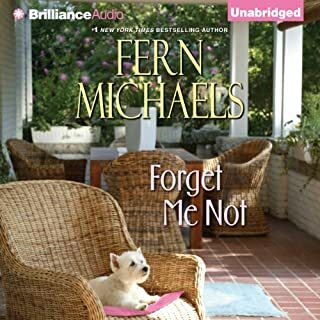 What was most disappointing about Fern Michaels’s story? The author over explains things as though she assumes the reader can't imagine anything. Both the dialogue and the narration of the main character and her best friend comes across as whiney. The main characters "fall in love" when they've only met twice, before they have even had spent a moment alone or know anything thing about each other. Apparently the author has decided to skip the whole actually writing a story and just put events to page rather than create a believable character study. Just horrible plot development. I'd like to read a book by the person who wrote the description of the book that sold me on it. That person can actually use words to entice the reader. The author tells us what a fabulous person the main character is but writes almost nothing that shows it. Also, the conflict in the story is that something has happened to the main character's parents and she believes they are not the people she thought they were. (Not a spoiler, that's given out very early in the story) The way this is resolved seems like the author couldn't come up with a satisfactory way to deal with those characters so she took the ridiculously easy way out. What didn’t you like about Emily Durante’s performance? Whiney whiney whiney! Both the main female character and her best friend's dialogue was spoken in a whiney horribly fake New Jersey accented voice. If any person actually sounded like either of these women no one could stand to be around them for 10 minutes much less fall head over heels in love for no apparent reason as in this story. What character would you cut from Forget Me Not? There were no extra characters. Just poorly created and written ones. I will never waste my time or money on anything by either this author or narrator. Because the idea of the story was good and I wanted to know what happened to the parents of the main character, I suffered through it but frankly, I'd like those 7 hours of my life back. 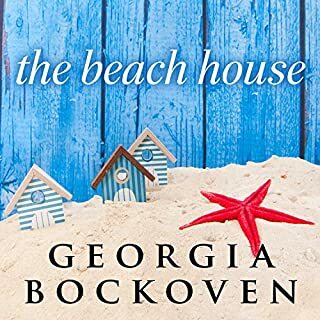 When 30-year-old Julia, mourning the death of her husband, decides to sell the Santa Cruz beach house they owned together, she sets in motion a final summer that will change the lives of all the families who rent it year after year. Teenaged Chris discovers the bittersweet joy of first love. Maggie and Joe, married sixty-five years, courageously face a separation that even their devotion cannot prevent. The married woman Peter yearns for suddenly comes within his reach. What did you like best about The Beach House? What did you like least? The characters were interesting but a bit dated and old fashioned. Predictable. It all ended very neatly, nothing unexpected. A few twists and turns would have added interest. Would you be willing to try another one of Joell A. Jacob’s performances? Absolutely not! She over pronounces every syllable and makes the characters dialogue sound stilted and very unbelievable. Nobody talks like that! I would have ordered the sequels if they were performed by someone else. A better performer reading it. The story was good enough that I would consider reading the sequels but absolutely wouldn't listen to this performer again. No, I would recommend the book but the narrator's voice is irritating especially when she tries to do accents or men's voices. It was so bad it was laughable at times. Her voice really diminished the story. Horrible at men's voices and accents.